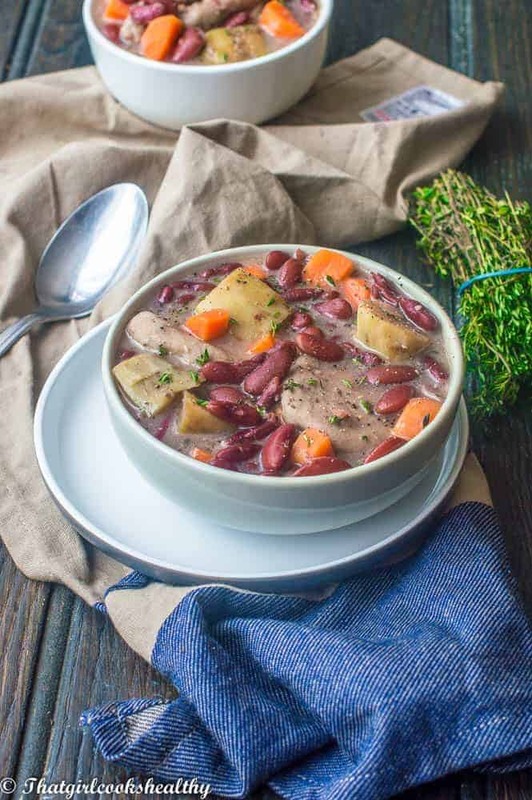 Learn how to make this heart warming vegan Jamaican red pea soup consisting of kidney beans simmered down in coconut with root vegetables and spices. When it comes to Caribbean food, most people think of the main entrees and fail to acknowledge our wonderful soups. Soup is big business in the Caribbean especially on Saturdays where it’s customary. 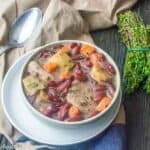 Red pea soup is full of flavour and most importantly my version is meat free/ital – great for vegans but meat eaters will fall in love with it too. In short red pea soup is a soup made from red kidney beans (known as red peas). The peas (usually dried) are rinsed and left to soak overnight. Then brought to a boil, simmered with herbs/spices and root vegetables. 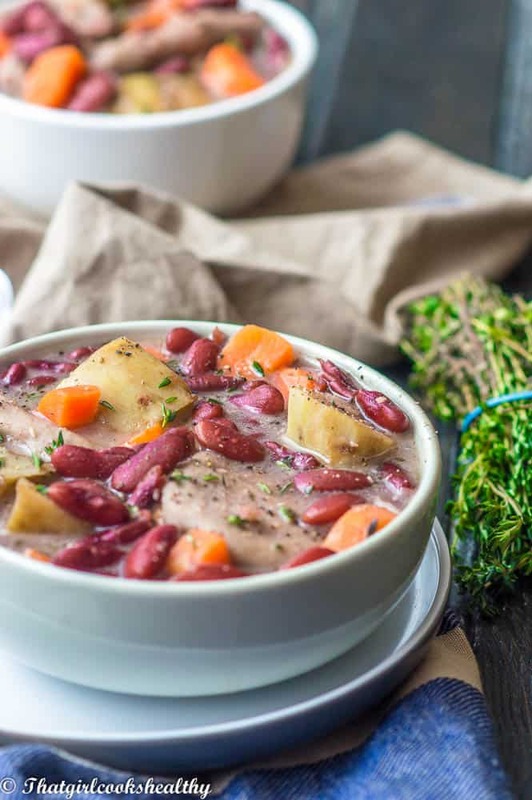 The majority of Jamaican red pea soup recipes are made with meat – pigtails and/or stewing beef is the preferred choice. When my family made this soup as non pork eaters, we would omit the pork, in fact we didn’t really use much meat at all. Sometimes we would add beef and other times it was shredded chicken. I supposed you could describe this as a red kidney bean soup, if you really wanted to. Red pea soup isn’t very difficult to make and doesn’t need any meat to make it flavoursome. I have however added extra garlic, a hint of ginger and black pepper for more flavour which isn’t typically done so there is more than enough herbs, spices and root vegetables to constitute the missing beef and pigtail. Soaking the beans – dried beans need to be soaked prior to boiling. Rinse the beans several times to rid the debris/dirt. Then soak them in enough water to cover them overnight or for several hours. Boiling the beans – the beans need to be boiled and cooked until tender. The beans should take around 50 minutes – 1hour to cook. A good way to determine its readiness is to spoon a few beans, cool them off and squash them with your fingers. If they mash quite easily, then they are ready and cooked thoroughly. Adding the vegetables + dumpling – I don’t like to go to crazy with the carbohydrates – some sweet potatoes and yam are more than enough carbs to yield a filling soup recipe. The vegetables should be added near towards the end of the cooking around 20-15 minutes before to ensure they don’t boil out. Boiled dumpling – While the peas are cooking, I would advise making the dumplings so they are ready to add the pot. You can roll them into spinners or disc shapes. I like to make both variations for most of my soup blends using gluten free flour. 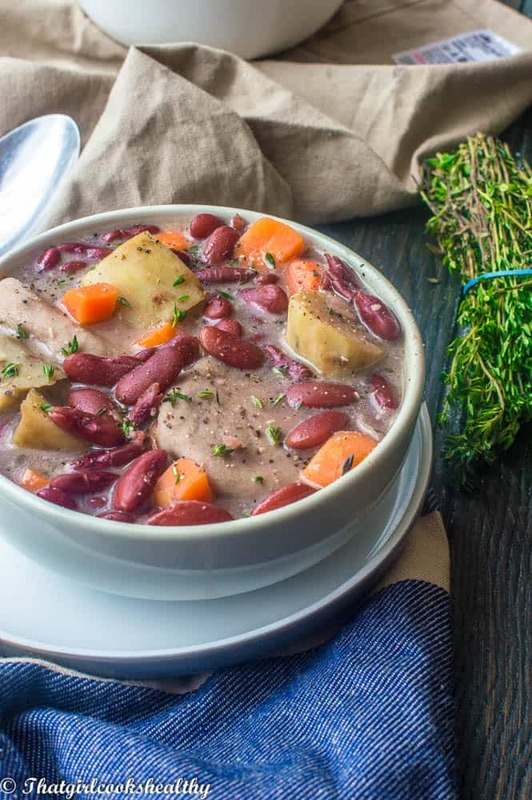 Even though my recipe is vegan if you’re want to add any meat, traditionally the beef and pigtail is boiled at the beginning along with the red kidney beans. Can I used canned kidney beans instead? I have never made red pea soup with canned beans but you could fast track the recipe by using canned beans (make sure it’s salt free). Just top up with 7 cups of water, cook with garlic and onions, scallion first for 15 minutes then add the rest of the ingredients and simmer for 15-20 minutes. Soak the red kidney beans in water for several hours or overnight, rinse, then place in a large stock pot. Place the red kidney beans in a medium sized bowl and fill with enough water to cover the beans. As the beans cook make the dumpling by adding the flour to a bowl with the pink salt, gradually pour the water into the flour and knead into a pliable dough ball. Take a small piece of the dough and roll into the palm of your hands to make spinners or flat into small discs, repeat with the remaining dough and set aside. Once the beans have tenderised, remove 1/2 cup worth of beans, mash them and add them to the pot. Add the coconut cream and season with garlic, ginger, black pepper and optional coriander. Cover the pot with a lid and allow to simmer for 20minutes.